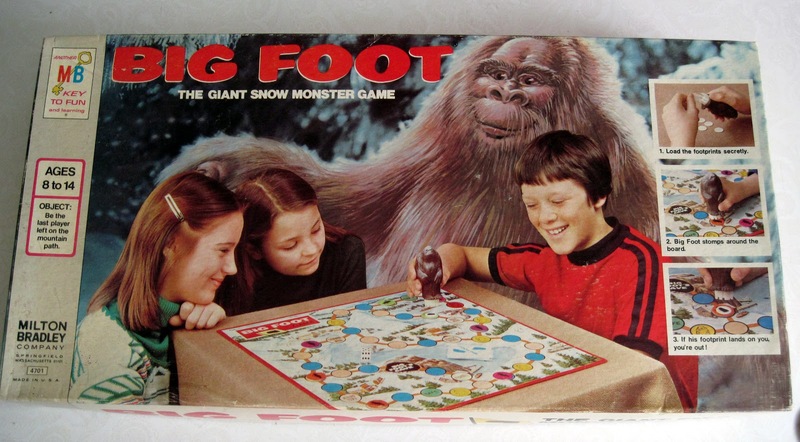 Bigfoot, he of the infamous giant footprints, scored his own board game in 1977. A scarce find today, it's one of my favorite monster themed games. 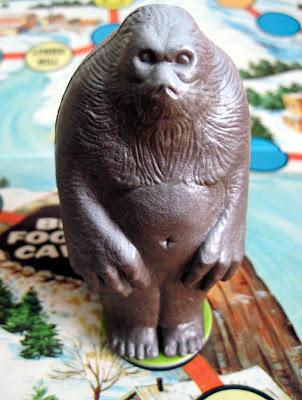 If this Bigfoot was meant to look friendly, the artist really missed the mark. He is clearly considering eating these children. Players select pawns, which appear to be mountaineers, explorers, or possibly Bigfoot hunters. 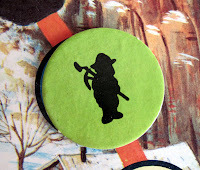 The game track takes players through prime Bigfoot habitat, including snowy slopes and dense forests. A mining town, lumber mill, gold mine, and supply store appear to offer shelter. As Bigfoot crosses or lands on a pawn, he dispenses a disk, which may or may not bear a footprint. If the print appears, that pawn is out of the game. Last player left unstepped upon wins! I have the Bigfoot game. 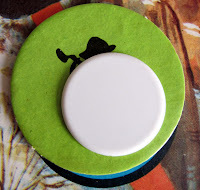 When you stamp the Bigfoot on the pogs, it makes such a satisfying click! I have to dig that game out of my parents game cubby! I loved this game! Sadly, we sold it 20 years ago. What a mistake! 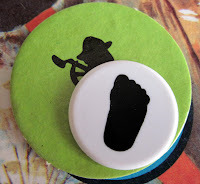 I wish I could help you, but sorry, I'm very fond of my Bigfoot game. However, there is one on eBay right now with Buy It Now available. It's pricey ($95) but still in shrink wrap. Some of my game pieces are missing .The ten disc and was wondering how many cards there are suppose to be? Anyone willing to sell me parts ,please let me know?